In this post we shall discuss the installation of Ubuntu Linux 8.10 also known as Intrepid Ibex. Let us now get started. 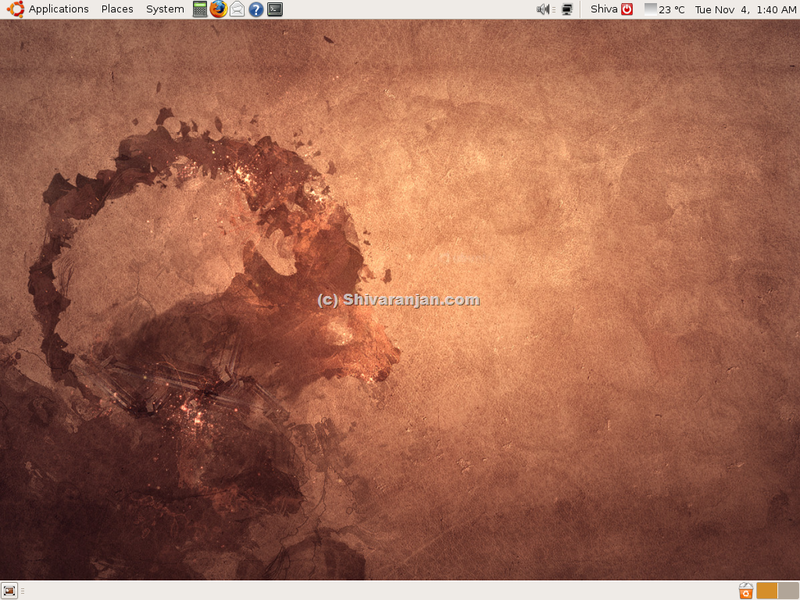 First download the Ubuntu 8.10 (Intrepid Ibex) ISO file from Ubuntu website. Now that you have the ISO burn it to a CD, using your favorite CD/DVD burning application. If you don’t wish waste a CD then you can create a Ubuntu bootable flash drive, more details on the instructions refer to our earlier post. Now that you got the bootable CD or USB drive for the Ubuntu installation, now restart your computer. Make sure that the computer is configured to boot from CD or USB. When the computer boots up using the bootable media, you will be presented with a screen as shown below. In this screen choose “English” as your preferred language, we are assuming here that English is your choice. You can go ahead and use any language of your choice. Four options are presented now they are, choose the first option “Try Ubuntu without any change to your computer”. 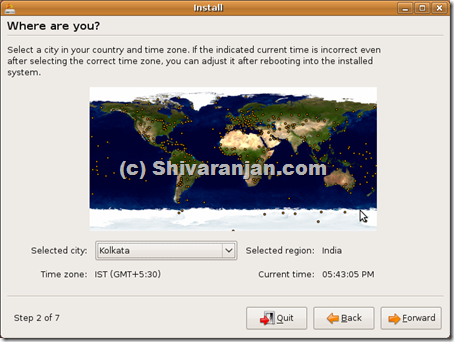 By choosing this option Ubuntu Linux would boot into Live CD mode and we can install the OS from there. Click the install button that is shown in the Ubuntu 8.10 live desktop and you are ready to begin with the Ubuntu 8.10 installation. Choose the your language as English and click the forward button. 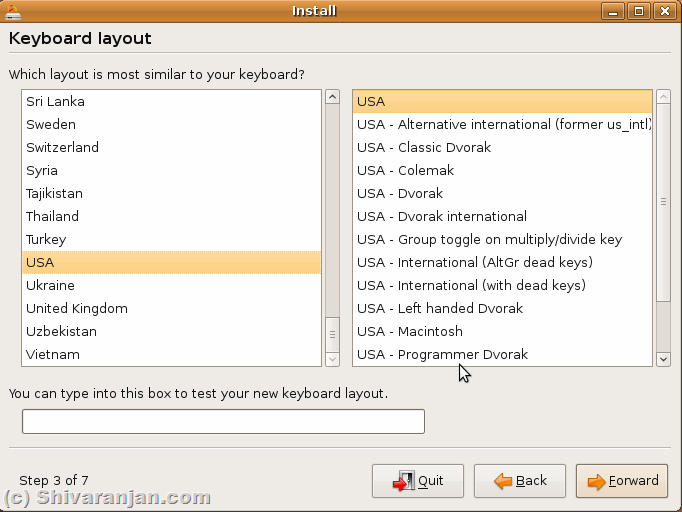 In this step choose the layout of the keyboard that you intend to use in Ubuntu. In the bottom screen if you wish you can test the layout before making the decision. 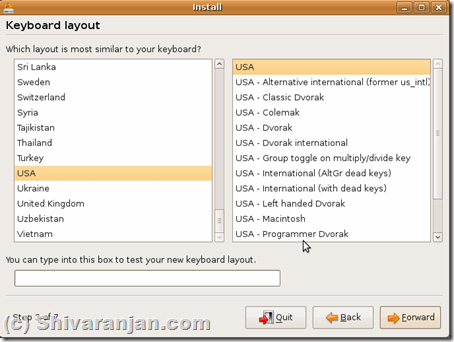 If you intend to use the entire hard disk drive with Ubuntu 8.10, then choose the first option “Guided – Use Entire Disk”. This option will automatically partition the hard disk drive and create the necessary swap partition also. 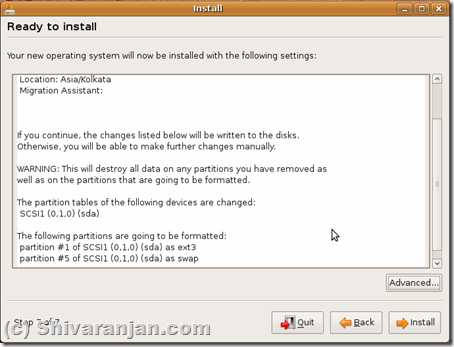 The second option is called manual option that allows you to partition the hard disk drive based on your requirement. The partition manager is pretty straight forward to use. Refer to the Screenshot below. 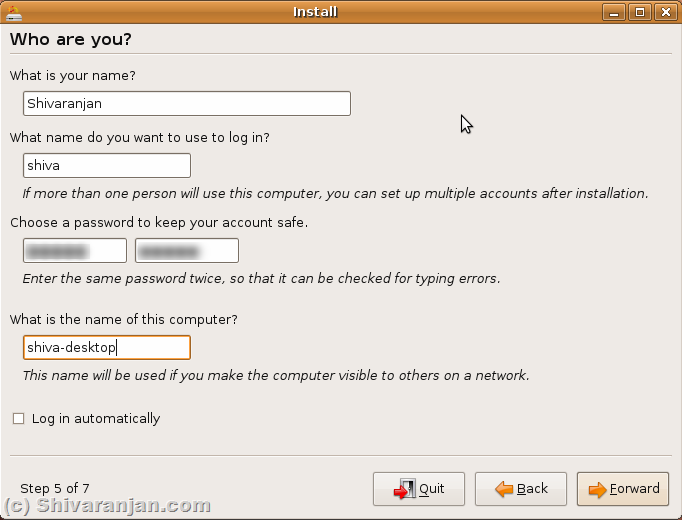 Once the partition manager has completed the partitioning the hard drive a screen will be presented in which the Name of the computer user, user name for login, password for login and computer name has to be chosen. 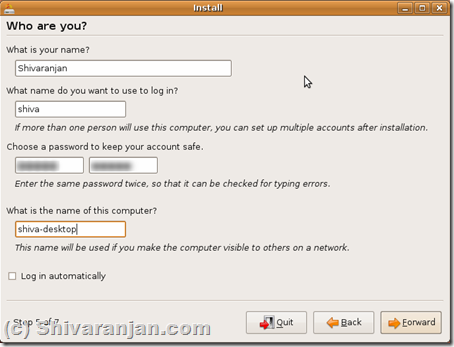 Also auto login option is provided here using which the user can be automatically login to the computer when the computer is started. 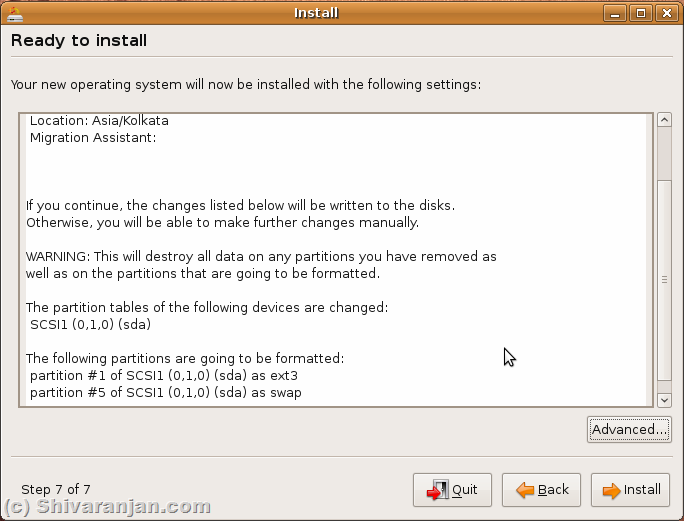 Now Ubuntu 8.10 Intrepid Ibex is ready to start the installation and a summary of chosen option is displayed, which can reviewed to check if the correct choices have been made during all these steps. 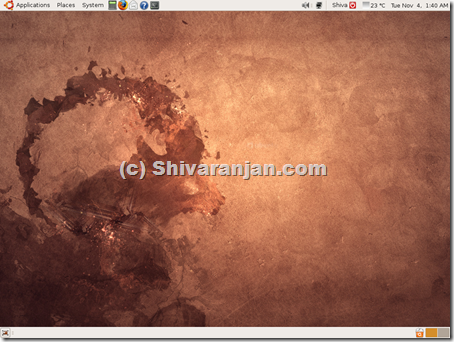 Access to advanced options are provided towards the bottom right corner, here the proxy details can be filled for Internet access and an option is provided to select the hard disk drive where you would like to install the Ubuntu boot loader. Please restraint caution here if you choose the wrong drive the boot loader will overwrite the existing boot loader and may damage your existing operating systems boot loader. Now the installation begins and now you can sit back relax as it will take around couple of minutes to an hour depending on the computers speed. Once the installation is complete, you can either continue to use the Live CD or restart to computer to boot into brand new shiny Ubuntu 8.10 desktop. After the computer has been restarted, you can now use Ubuntu 8.10 Intrepid Ibex. Now enjoy using Ubuntu 8.10 Intrepid Ibex, in case of questions please post in the comments section.